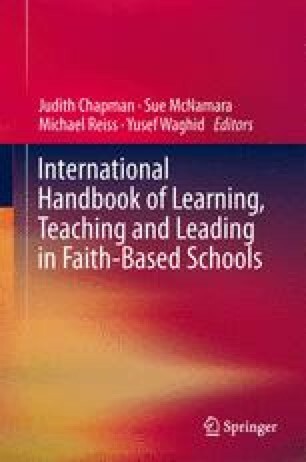 The issue which this chapter explores is the extent to which, and the ways in which, the ethos of a faith-based school should include a commitment to particular qualities of the work in every classroom. The chapter discusses several innovations in classroom work, including interaction in dialogue between teachers and students, the nature of the feedback given to students about their written work, and the interactions between students themselves whether in whole-class discussions or in group exercises. The claim being made is that although work on the innovations which the chapter reviews have been aimed at all schools, faith-based schools should recognise that it has particular significance for them, in that their mission should be implemented in the day-to-day detail of the way every teacher respects and enhances the unique dignity of every pupil, thereby helping them to become autonomous and responsible learners, capable both of managing their own learning and of engaging in fruitful collaboration with others. Whilst on one level, this approach should be guided by the aim of building the personal capacity and the confidence of every pupil, it is also argued that on a second level, the commitment of each teacher to this aim should itself enhance the personal and spiritual development of teachers themselves.